The Gravity Flow Form Connector Extension version 1.2 is now available via auto-update and for download from the account page. This release contains some frequently requested new features and some bug fixes and we recommend that customers upgrade as soon as possible. Important: please ensure you’ve updated Gravity Flow to the latest version (currently 1.7) before upgrading the Form Connector extension. It’s now much easier to update field values in the current workflow entry. When the target form is the same as the source form, the “Entry ID (Self)” option will be available in the Entry ID Field setting. 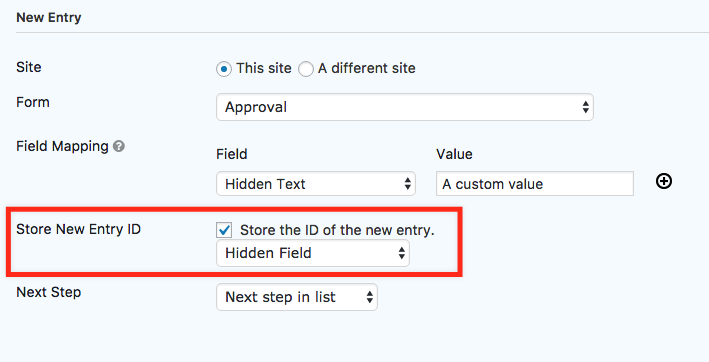 The New Entry step has a new setting which will store the ID of the newly created entry in a field on the current workflow entry. This is very useful when used in conjunction with Update Entry steps later on in the workflow. – Added the Store New Entry ID setting to the New Entry step settings. – Added the gravityflowformconnector_update_entry_id filter to allow the target entry ID to be modified. – Added support for updating the same entry when the target and source forms are the same. 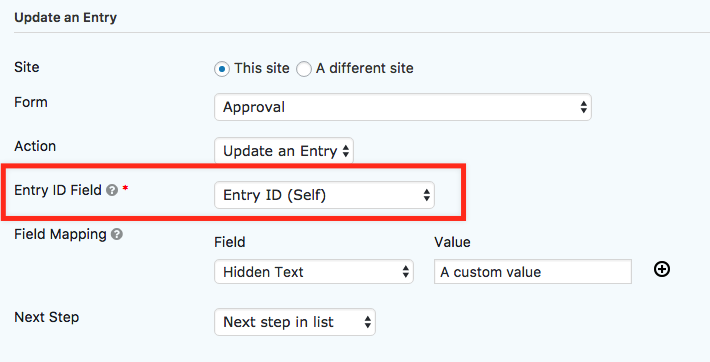 Select Entry ID (Self) in the Entry ID field setting. – Fixed an issue with the approval action of the Update Entry Step for entries created with the New Entry step. – Fixed an issue with the field mappings which may affect some forms. – Fixed an issue with the update step when triggered by a schedule or the expiration of a previous step where the approval or user input action does not complete. – Fixed an issue with the update step where remote approval and user input steps can fail on some servers. Requires Gravity Flow 1.6.2-dev+.